E-cigarettes and summertime were made for each other. In reality, e-cigarettes were pretty much made for every season, every occasion, and to be used in any daily situation, but they are especially awesome in the summer. Summer calls for celebration, especially if you live in an area of the country that has just come out of one of the most brutal winters ever. Feeling the warmth on your skin, being able to wear less clothing, and having all the freedom that warm weather brings makes it a season to be savored, and that makes it even better when you’re vaping. So to celebrate the amazingness that is the season of summer, we’re having a sweet little summer sale. 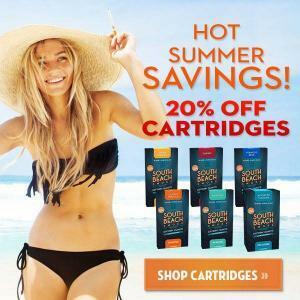 Right now, all cartridges are all priced at 20% off! It’s perfect for saving a little cash, stocking up for all of your summer adventures, and getting what need at a great price. Looking to try a new flavor? Need to grab a few packs for your personal inventory? Need a good reason to just get some more e-cigarette cartridges? Take advantage now! Summer often means more get togethers with friends, lots of nights out, parties, and lots of time spent outdoors. And what could be better than having your e-cigs with you in all of your favorite flavors? When you’re a vaper, there is no such thing as too many cartridges; you always need them, and you always could use extras in different flavors to enjoy, and we sure have a hefty assortment to choose from! Summer is a really dynamic season, and it really makes people want to get out and enjoy the weather and the offerings it brings. Grab some South Beach Smoke e-cigarettes, load up on cartridges while they’re priced so sweetly, and go enjoy the season! Hot times call for hot savings! How Can Electronic Cigarettes Save You Money?